I’m also not as great of a player as Oliver Roeder, the blogger over at 538. 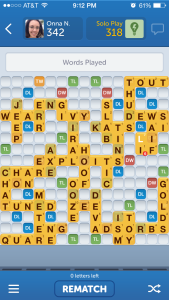 He’s only played 455 games of WWF, but his average score is much higher than mine. He also ranked somewhere in national Scrabble tournaments. 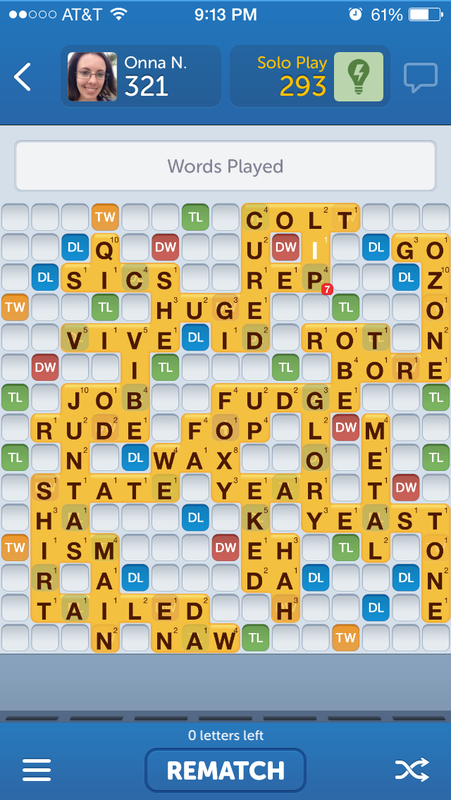 I entered once, and got promptly pummeled during the first few rounds. 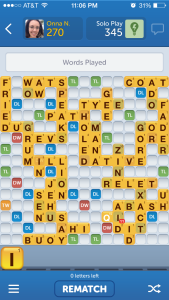 As it turns out, one needs to average one bingo (play all 7 tiles) per game to even begin to play competitive Scrabble. 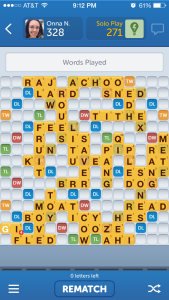 According to the WWF app, I average one bingo every 5 or 6 games, so I still have a long way to go. 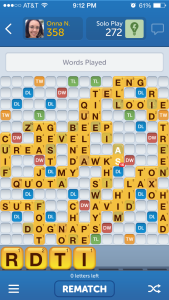 Oliver bested the AI easily, but I wanted to try out the WWF Solo Play AI myself. Was the AI that bad? Or would a more “average” player like me be challenged by it? I followed the same rules FiveThirtyEight did: no cheating, and play a total of six games. For science. 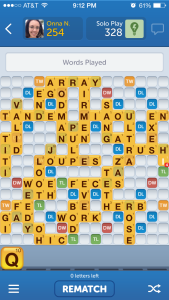 (And yes, I did screenshot the first 5 games all at once, hence the timestamp). I’d like to point out that “ORE” down at the bottom was played by the computer. 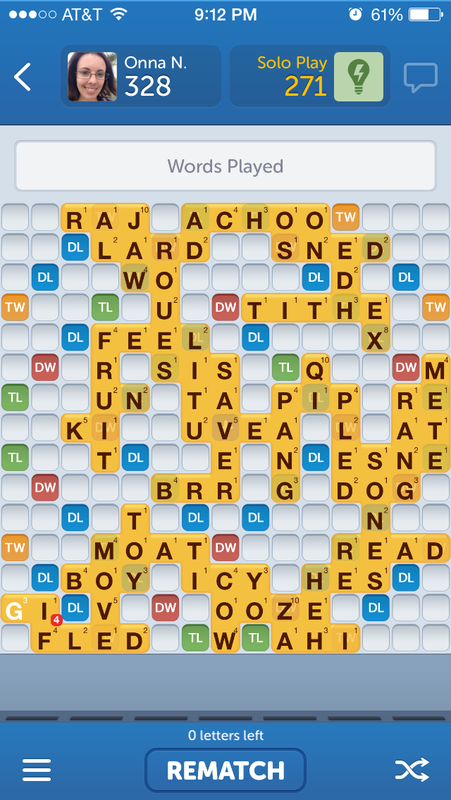 The AI seems to get the strategy of racking up points by stacking two-letter words sideways. Ouch. 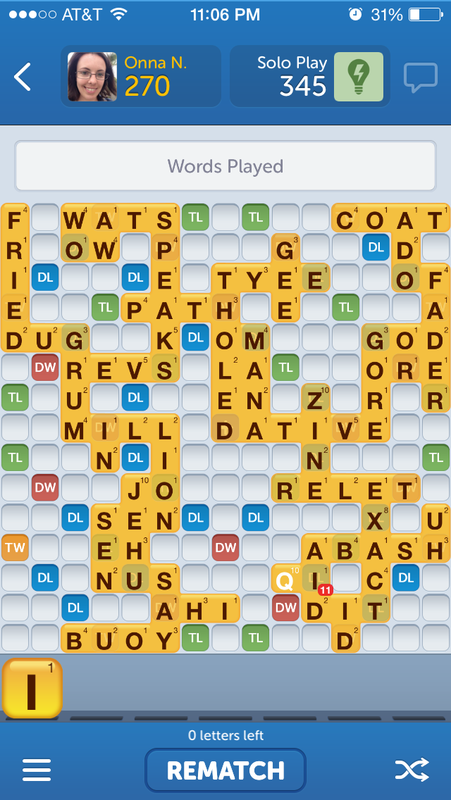 I was left with a Q and nowhere to play it. 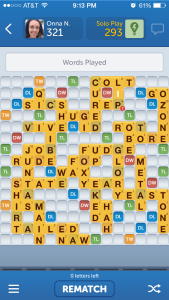 Even so, a paltry 254 points is a pretty bad score. I have no excuses. At this point, the AI seems to be matching my abilities a little better. 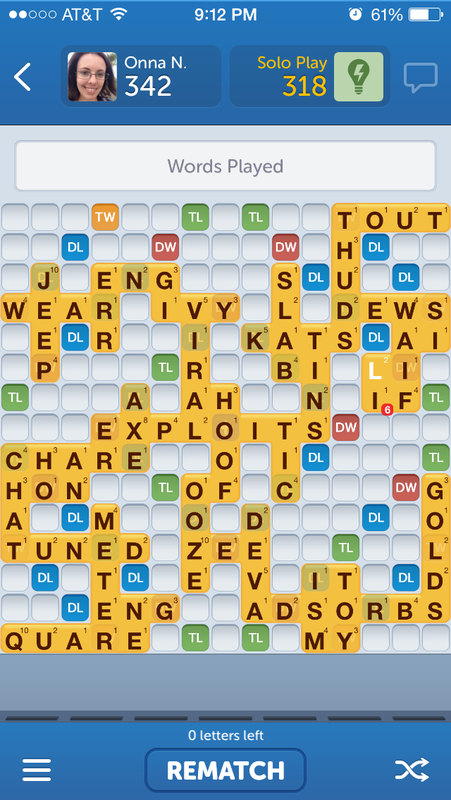 A score in the low 300’s is more in-line with my typical game. 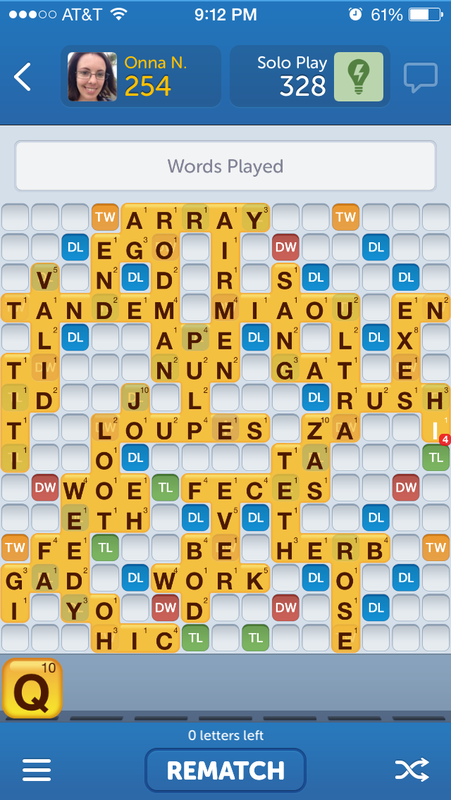 All in all, I averaged 312 points while the AI averaged 304. This difference isn’t statistically significant either (χ² = 30, df = 25, p-value = 0.2243). So, the computer did more or less seem to match me in ability. Although many players would be discouraged from constantly being beaten by the computer, I think if the goal is to “challenge” oneself to improve, the AI should place itself at the user’s level, or slightly higher. It appears the AI places itself below the user’s level, but not statistically significantly so. When playing against Oliver from FiveThirtyEight, the AI averaged 341, while he averaged a whopping 451. In Oliver’s case, it may be that the AI just doesn’t have the strategy to compete with nationally-ranked players, and ends up way below his level. My verdict? 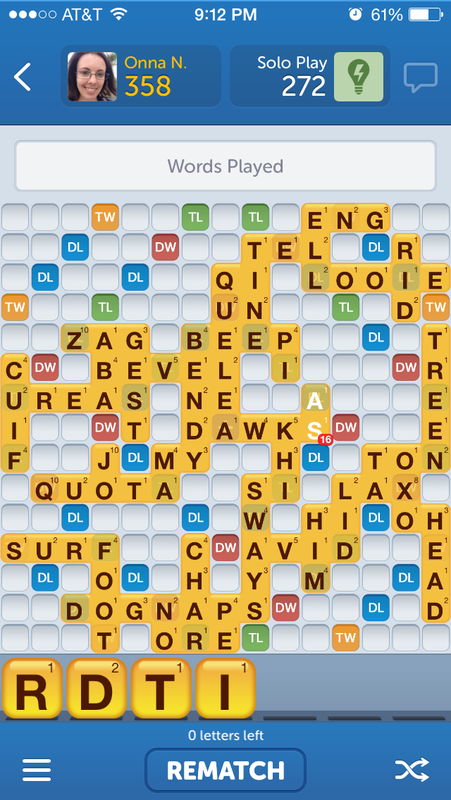 For superstar players, the WWF Solo Play AI might not be a challenge. For the rest of us, it seems to adapt to our abilities quite well, and even boost our egos by letting us win most of the time.